Be prepared to wait for at least half a year if you are planning to build a toilet under the Swachh Bharat Mission-Urban. As on November 16, 2017, more than 1.27 million applications were pending for approval—81 per cent of them had been delayed by over six months. The five states that have the maximum number of applications pending for over six months are Chhattisgarh (138,076), Assam (130,637), poll-bound Madhya Pradesh (120,361), Maharashtra (104,444) and Bihar (72,475). In fact, all states and union territories had applications that had been pending for more than half a year. The delay is not just restricted to the approval of the application forms. The scheme has consistently failed to deliver on the targets. Picture this: In 2015-16, only 0.12 million individual toilets were constructed out of the targeted 2.5 million toilets. Similarly, in 2016-17, only 40 per cent of the 3.5 million-target was met. In other words, the scheme had a backlog of 4.4 million toilets by March 2017. 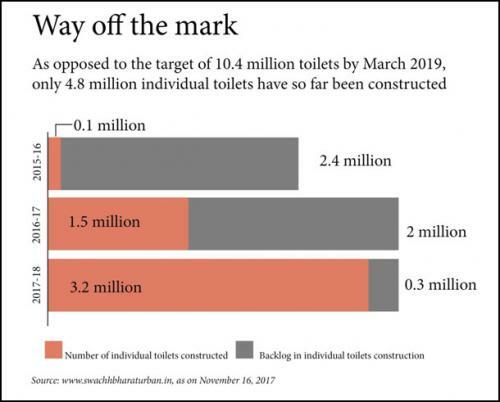 Even though the scheme has picked up pace in the current financial year, the government is likely miss the overall target (10.4 million individual toilets) under the scheme that ends in March 2019.